Chicken Bacon Swiss Breakfast Casserole with Cinnamon Rolls is a fun and easy breakfast or brunch recipe. 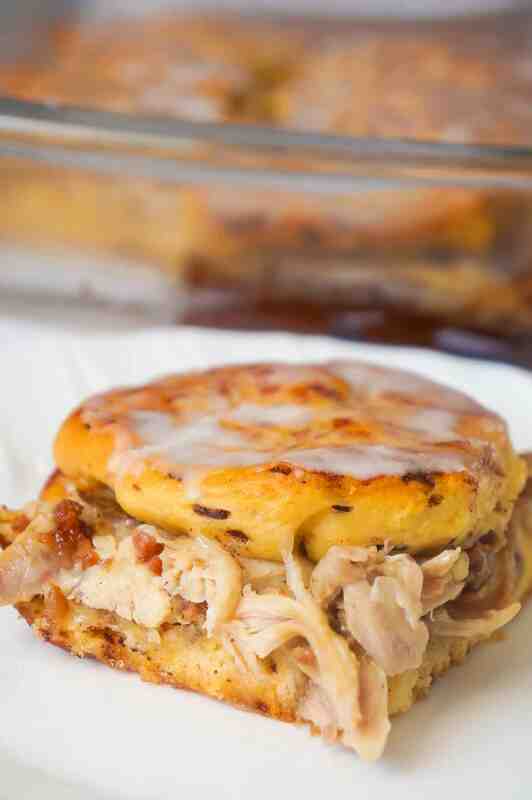 This easy casserole recipe uses rotisserie chicken and Pillsbury Cinnamon Rolls to save on time. 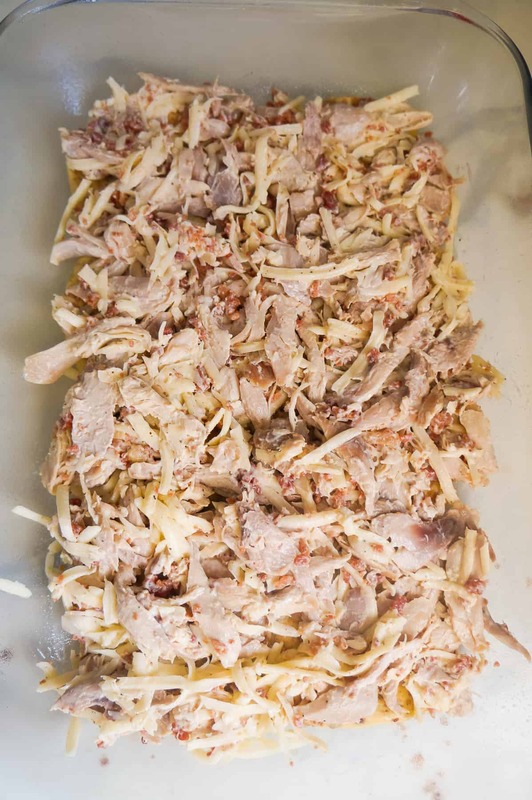 To make this brunch casserole I started by mixing together some shredded rotisserie chicken, real bacon bits, shredded Swiss Cheese and mayo. 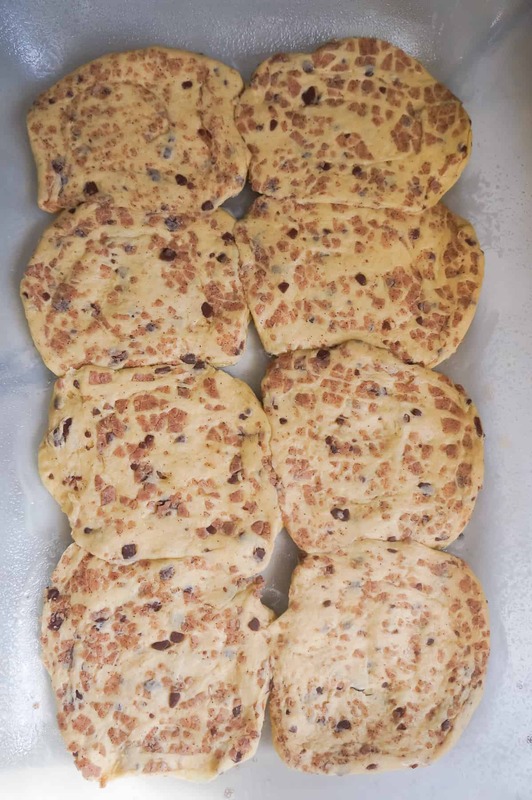 Then I opened one package of eight cinnamon rolls and used my hands to press each roll out until they were very thin. I placed the eight flattened cinnamon rolls into the bottom of a greased 9 x 13 inch baking dish trying to cover as much of the bottom of the dish as possible. Then I dumped the chicken mixture on top of the cinnamon rolls and spread it out evenly. I opened a second package of eight cinnamon rolls and again flattened each roll out with my hands. Then I placed the flattened rolls over the chicken mixture. I baked the casserole until the cinnamon buns were nicely browned on top. Then I removed it from the oven and spread one of the cups of Pillsbury icing on top. I only used one of the icing cups because using both would make the casserole a bit too sweet. Once the icing was on, the casserole was ready to slice and serve. 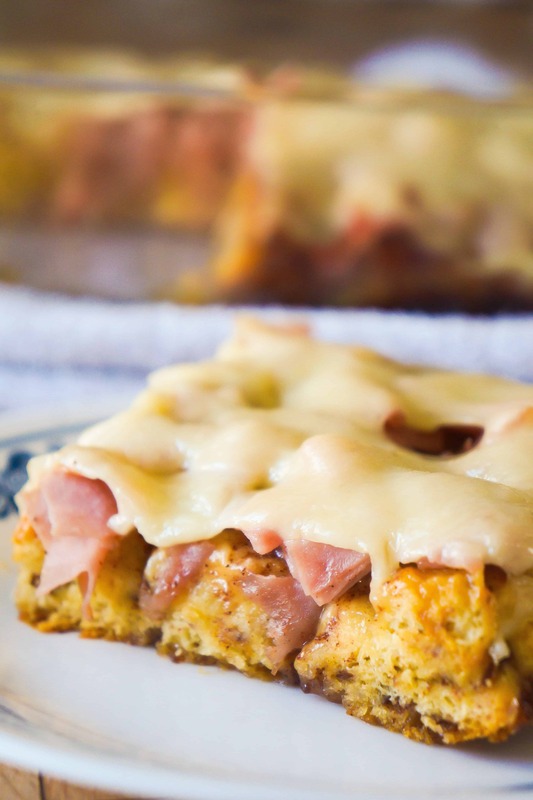 This Chicken Bacon Swiss Breakfast Casserole is just the right combination of savoury and sweet. 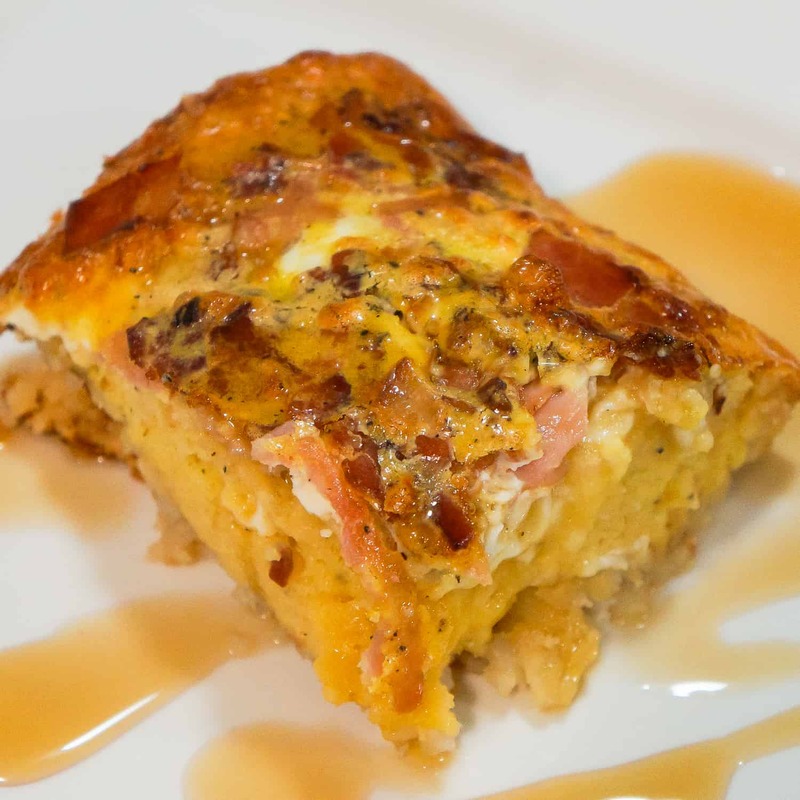 If you are looking for more easy breakfast recipes check out Maple Pancake Breakfast Casserole, Monte Cristo Breakfast Casserole and Peanut Butter Cup French Toast. Another easy breakfast casserole recipe. Check out this Maple Pancake Breakfast Casserole! 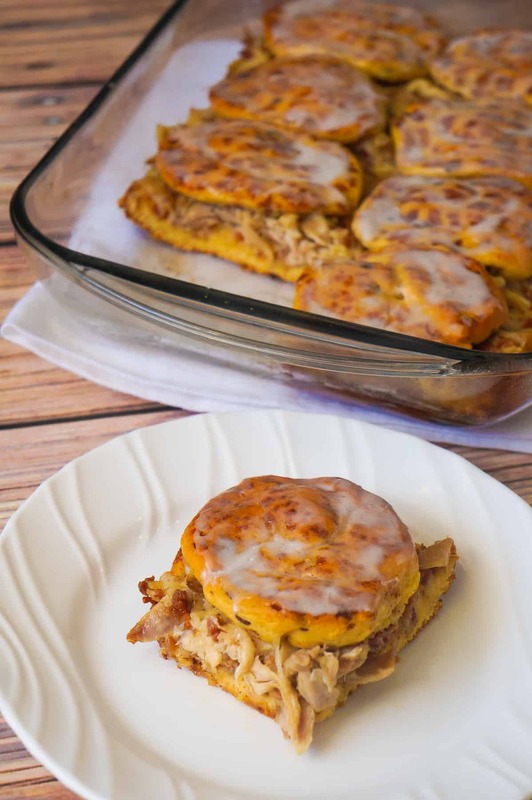 Be sure to also check out this Monte Cristo Breakfast Casserole! 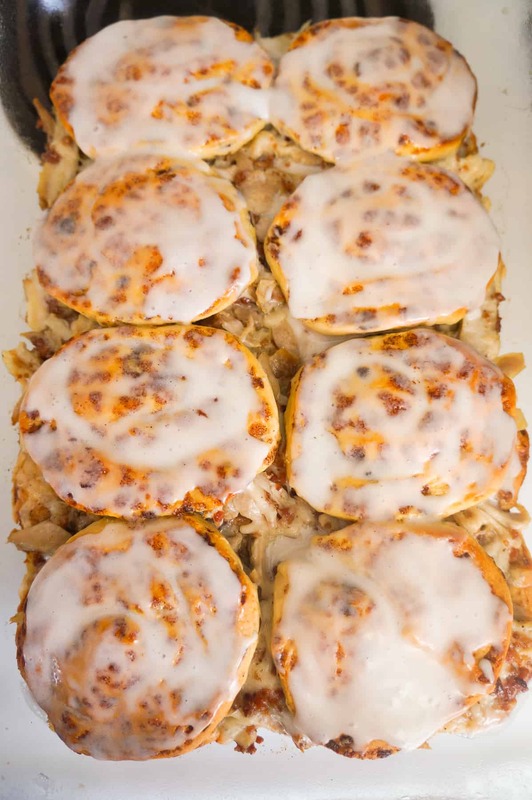 Chicken Bacon Swiss Breakfast Casserole with Cinnamon Rolls is a fun and easy breakfast or brunch recipe. 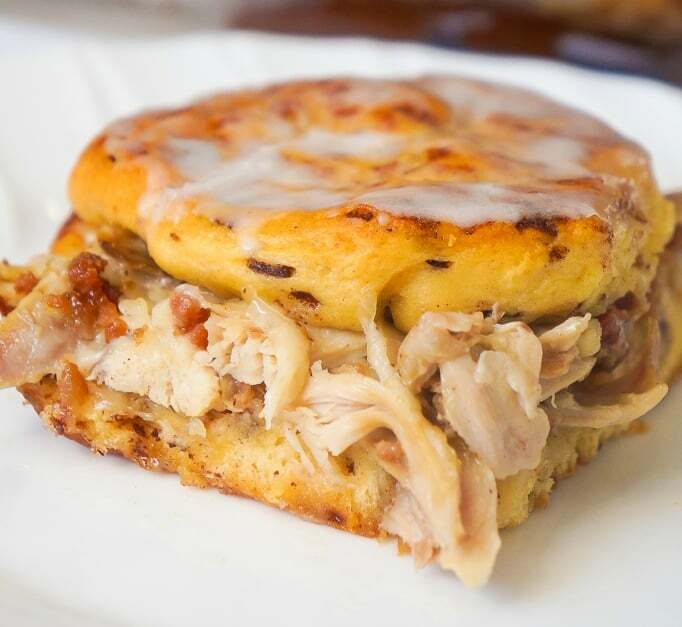 This easy casserole recipe uses rotisserie chicken and Pillsbury Cinnamon Rolls to save on time. 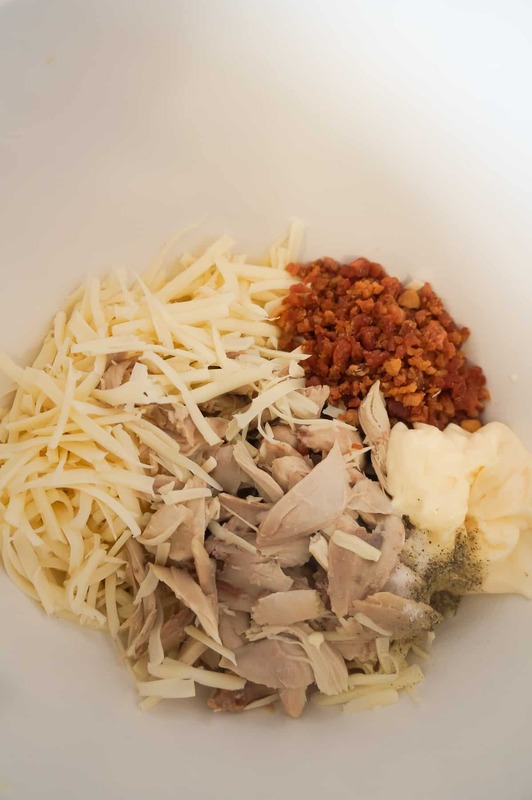 In a medium mixing bowl combine chicken, Swiss cheese, bacon bits, mayo, salt and pepper. Stir well. 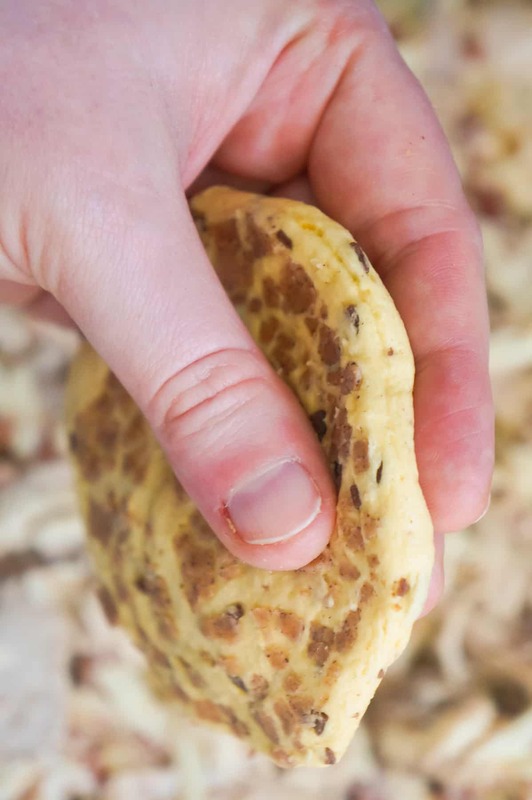 Open one can of cinnamon rolls and use your hands to flatten each of the eight rolls out thinly. Placed the flattened rolls in the bottom of a greased 9 x 13 inch baking dish covering as much as the bottom of the dish as possible. 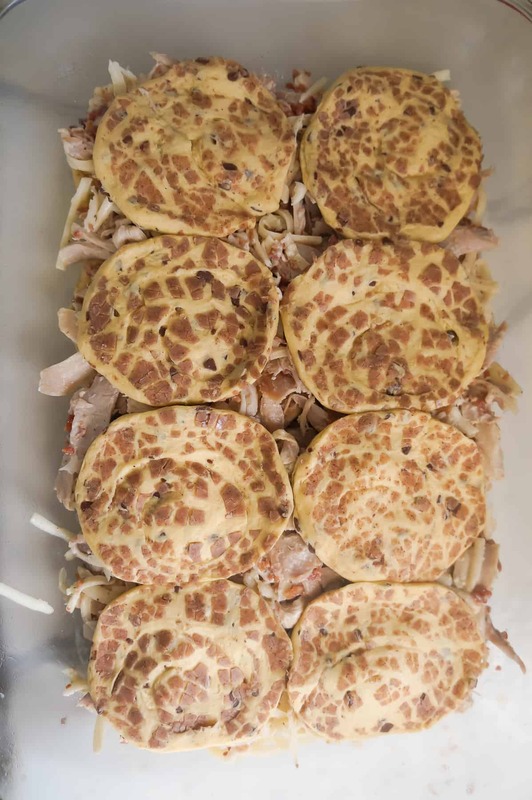 Pour the chicken mixture over the flattened rolls and spread it out evenly. Open the second can of cinnamon rolls and again flatten out all of the rolls. Place the flattened rolls over the chicken mixture. 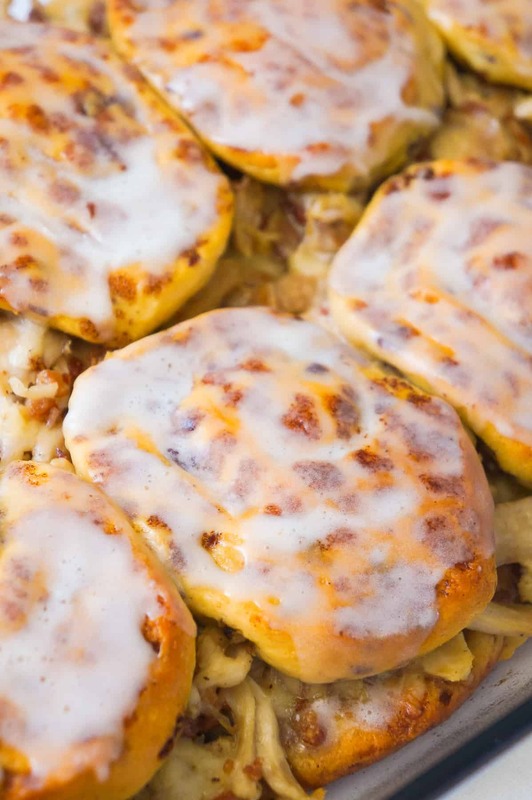 Place the casserole in the oven and bake until cinnamon rolls are nicely browned. 22-25 minutes. Remove the casserole and spread one of the little cups of Pillsbury icing on top of the rolls. Don't use the second cup.